No one can ever stop a person if he really wants to pursue his goal in life. 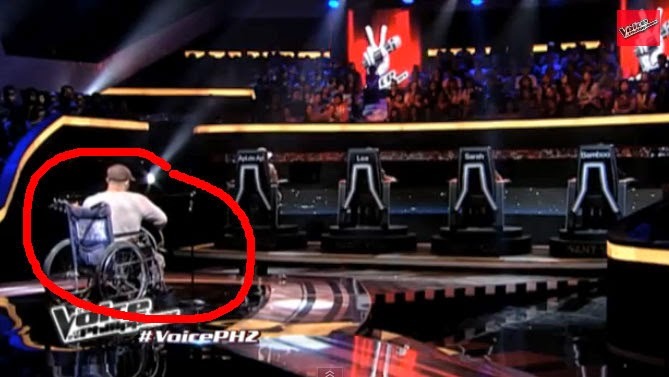 The persons with disabilities who tries the blind auditions of The Voice PH 2 on Sunday, became part of the Team Bamboo. His is Karlo Mojica, he is from Makati City. Even at his young age, Mojica has been unable to walk properly that's why he came on stage sitting on his wheelchair. He already proved to all that he can become independent by singing the song of Mr. Freddie Aguilar's "Bulag, Pipi, Bingi." And fortunately, coach Bamboo and apl.de.ap turned for him. Apl.de.ap. said to him, "Napakasarap ng damdamin ng boses mo. That was an amazing performance. We have a similar story. I myself I'm disabled, I'm legally blind but I never let that stop me in achieving my dreams. And I see that, I see that in your heart, in your soul, and I think talagang bagay na bagay na tayo at matutulungan natin ang isa't isa. Sana mapunta ka sa team ko." Watch Karlo Mojica how he play guitar and sing the song "Bulag, Pipi, Bingi." And Mojica eventually chose Bamboo as his coach, explaining that both of them experienced being in a band. Comments or suggestions about "WATCH: PWD became part of Team Bamboo in 'Voice PH 2'" is important to us, you may share it by using the comment box below.